Kimana is a small Kenyan town that is nestled along the border of Tanzania in Masai land near Mt. Kilimanjaro. Seeing a great need within his country for ministering to orphans, Dr. Steve Kabachia, the founder of JHM, received a vision from God to begin an orphanage in Loitoktok. He saw a specific need in this region after visiting a local orphanage on a church-planting mission trip. After years of planning and fundraising, the vision is now being realized. The orphanage is a Kenyan-birthed and Kenyan-run endeavor meeting the needs of Kenyan orphans from all over the country. Our vision is that it will be a self-sufficient orphanage with electricity, clean water, kitchen, dining, and lodging facilities, and a farm. In 2012, we sent a shipping container from Savannah, GA with a Kubota tractor that is being used to plant and produce crops. There are nearly 20 acres of land that are available for crops and future expansion. We are working to complete the 5 houses, kitchen facility and storage building. 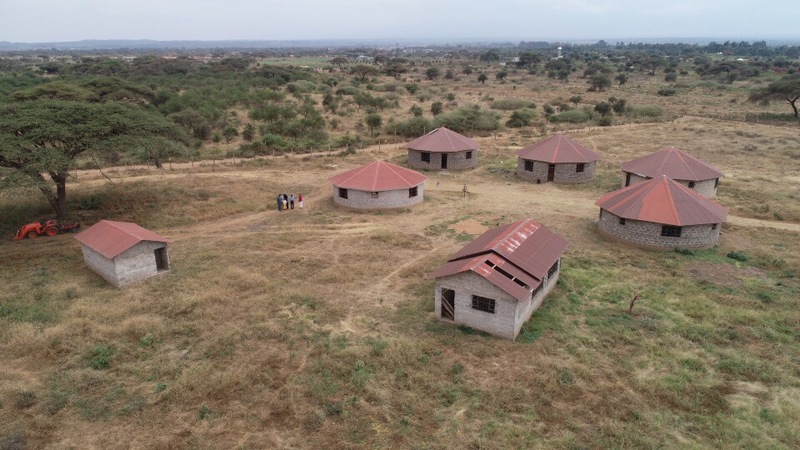 Each housing unit will ultimately sleep 12 orphans which will allow us to serve 60 orphans total. We would like each house will have a house mother and/or father. The children will go to the local school and will have an opportunity to further their education and develop life skills. After our medical mission trip to Tororo in 2013, our mission team traveled to Kimana and participated in a service of dedication of the first orphanage building. Many of the Agape Fellowship leadership attended including some local community leaders. Watch this video to hear Dr. Kabachia explain the vision for the orphanage. The orphanage buildings are nearly complete but still require some interior work. In 2018, a deep water borehole was drilled that will supply the entire site with clean water. We are partnering with our friends at Designs for Hope to send a team in early 2020 to install the water pump and irrigation lines for the land. Once completed, we will be very close to opening the orphanage for children to come. Please consider partnering with us. Your support is invaluable as we continue to expand the scope of this ministry. We would like to particularly thank our church partners who have made contributions to this project. If you'd like to also join us, please contact us!